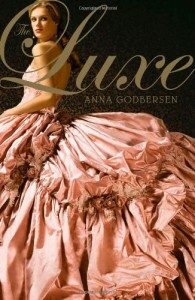 I love Anna Godbersen's Bright Young Things series and I thought that I would check out The Luxe. I'd tried reading it at school but I didn't really have a clue of what was going on and it didn't really interest me at the time since it sounded a lot like what was going on around me (I was at school after all). I think what attracted me to the book in the first place was the amazingly gorgeous cover. It has embossed butterflies on and an insanely pretty dress on it! I wasn't to fond of most of the characters. For the most part, they seemed generic and hard to empathise with. I absolutely loathed Penelope; as cruel as it sounds, I wished that it was her floating in the Hudson rather than Elizabeth. She was a lot of the things that I hate in a person: sly, manipulative, stubborn and incredibly jealous to the point of no reason. However, I did quite like Diana, she was the most well-rounded character. The New York setting is fantastic, but I felt that the city wasn't really explored enough. I like getting to see a city like New York from all angles, but here I only got to see it from the high-class angle, which bored me a little bit. Hopefully the city is explored more throughout the series. One thing that I think is incredibly clichéd and I cannot stand is love triangles. Which there are two of in this book. I honestly find love triangles to be incredibly boring and something that makes me roll my eyes in think 'really?'. However, they do add a bit of something to the plot. I love Godbersen's writing style; I often find that her beautiful way of describing objects, people and places is the best part of her work as I'm able to form a good clear image from her descriptions. I can honestly say that the descriptions and imagery was definitely the best part of this book, that's probably how the book earned the rating that I've given it. Overall, I wasn't too impressed with The Luxe and I'm hoping that the next books in the series will be better, since this wasn't a particularly strong start to the series. Not much happened, the characters were quite generic and the pace was just a bit too slow for me. Oh well.